This recipe sounds yummmm. It comes from Sally’s Baking Addiction. (4) Wholesome and healthy. Well, compared to skillet brownies at least. (5) Sweet and salty! Sweet and salty! 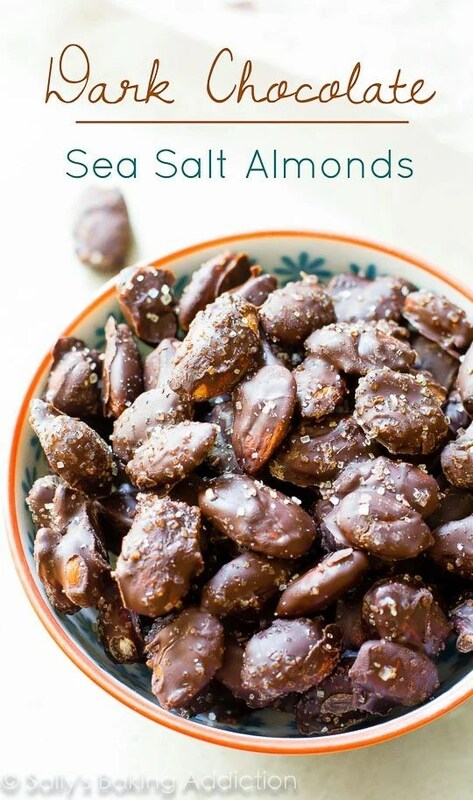 These were inspired by a carton of Trader Joes sea salt & turbinado sugar chocolate almonds that Marie brought with her when she visited. Aka the snack I COULD NOT STOP EATING. Have you ever tried them before? If so, you know the struggle. Turns out, making them at home is cheaper. Don’t know if that is a wonderful or terrible (dangerous) thing. Oh, and homemade always tastes better than store-bought. Case in point. 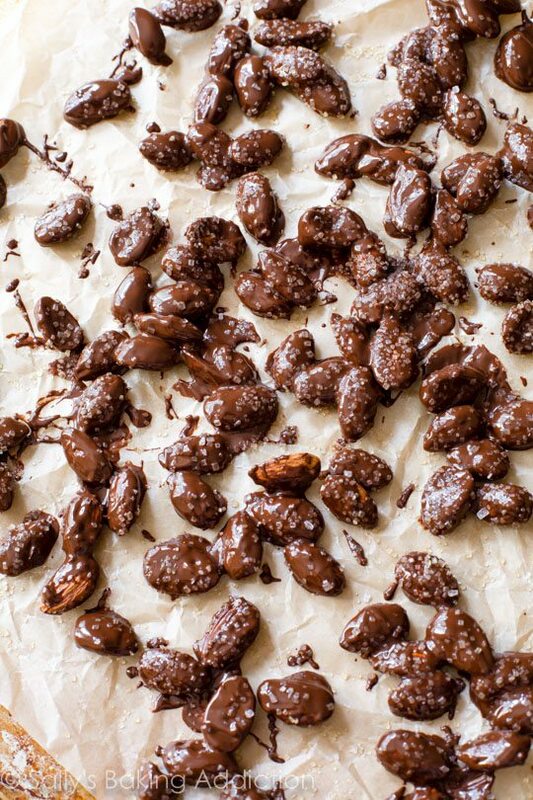 The number one ingredient is, duh, almonds. Since there are so little ingredients in this snack, make sure you’re using high quality. The almonds? Diamond of California. No ifs, ands, or buts. 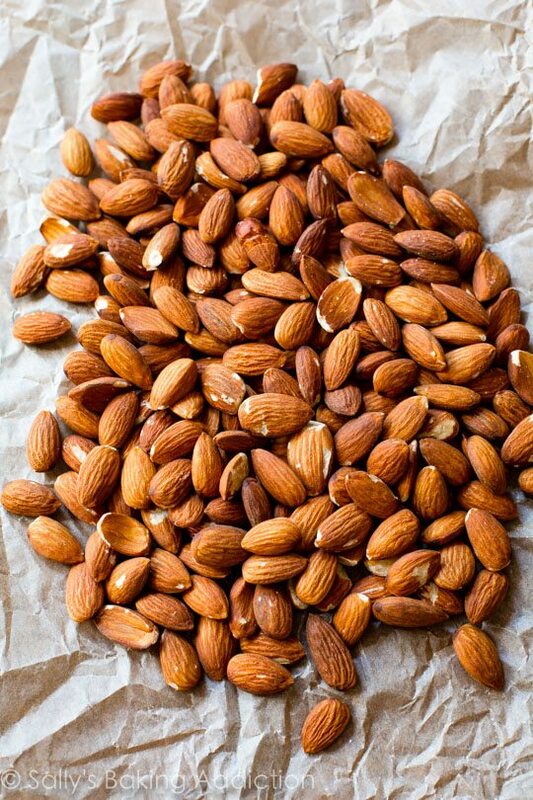 Fresh, unsalted, nutrient-dense whole almonds. Doesn’t get much healthier than that! And now, the chocolate. Whoaaa. That sounded really awkward. You know what I mean. A helpful tool = this 3-piece dipping tool set. These inexpensive tools will be your lifesaver when you begin making Sally’s Candy Addiction recipes next month! I use the 3-pronged tool for these to help lift the almonds out of the chocolate pool and shake off as much excess chocolate as I can. 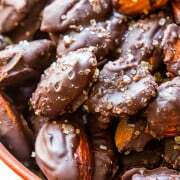 It helped me separate the almonds so I wasn’t left with chocolate almond clusters– rather, individual chocolate almonds. The finishing touch is a sprinkle of sea salt and turbinado sugar (I use Sugar In The Raw). Any coarse sugar works! I loooooove the added crunch the sugar gives and the flavor balance of the sea salt. 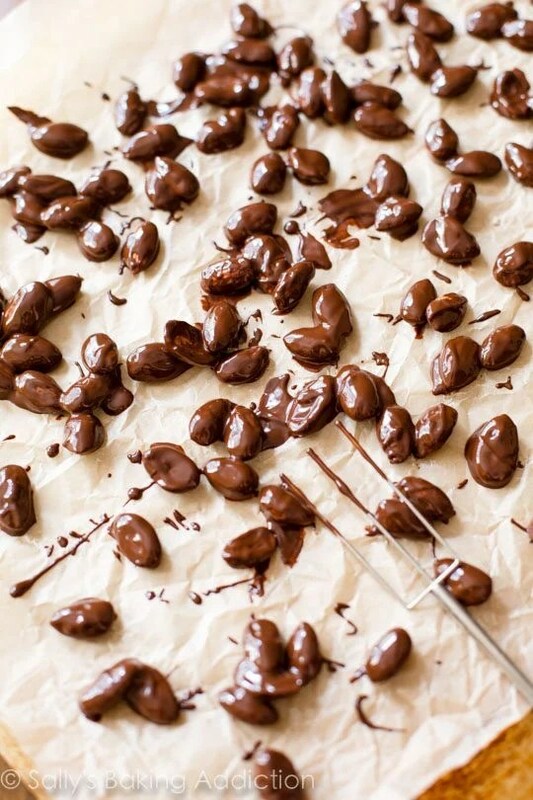 The nuts are wonderful simply coated in chocolate, but the light sprinkle of sugar & salt turns them up about 10 notches. 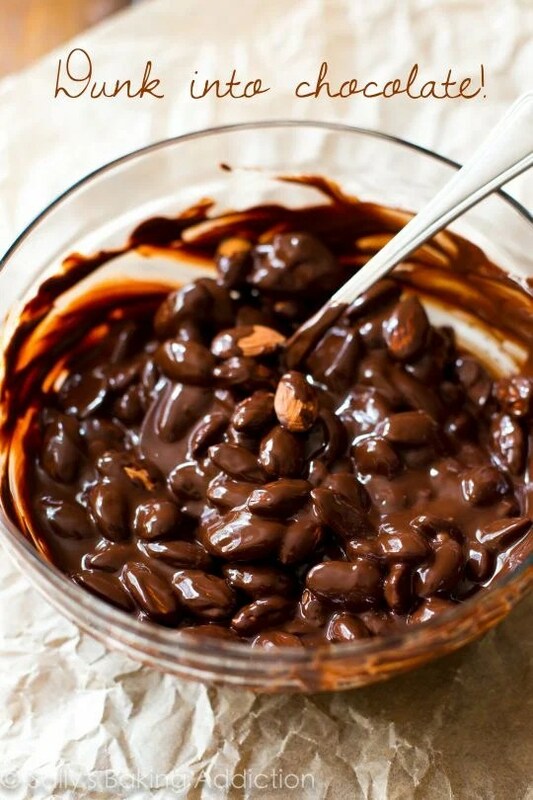 Only 4 simple, convenient ingredients transformed into something extraordinary. And within minutes too! Plus, they’re a good source of protein, energy, and let’s not forget all that glorious sweet and salty crunch. Mmm. 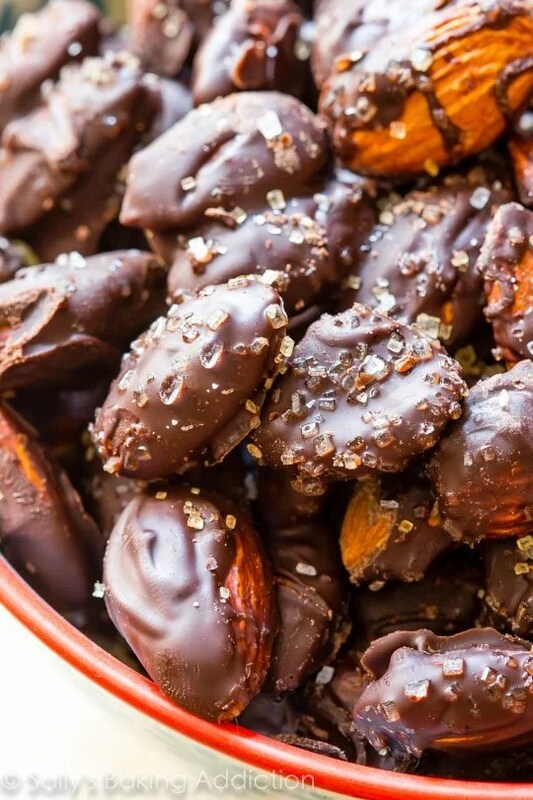 Seriously, make these today.